I wanted some nice stickers on my MegaDrum box (It comes without) to make it look better. So I designed a front for the box in Adobe Illustrator. First i measured the box’s front plate and redraw it in Illustrator. Then I took a digital photo of the box and then cutted out the front panel in photoshop and pasted it in Illustrator into the drawn illustrator frontpanel. Then I added some nice sticker text to all buttons in the design and printed it out. I have now continued the project and trimmed the design slightly. Print it on Inkjet Sticker Vinyl Film…Added some “clear” self adhesive sticker above it as protection. I have also made some adjustments to the length of the rotary encoders – cut them by 3 mm, painted all nuts and washers in black color. I am not totally satisfied yet…stay tuned…updates will follow. I have added a LCD-frame in front of the LCD which made the MegaDRUM look like something available on the market. I found one that work well at Conrads.se. Stay tuned photos is coming up! 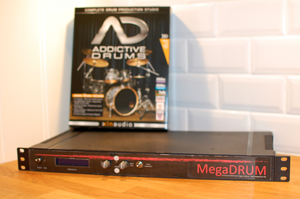 Front Sticker for the MegaDRUM Module 19″ Rack in PDF file format. REAR Sticker for the MegaDRUM Module 19″ Rack in PDF file format.